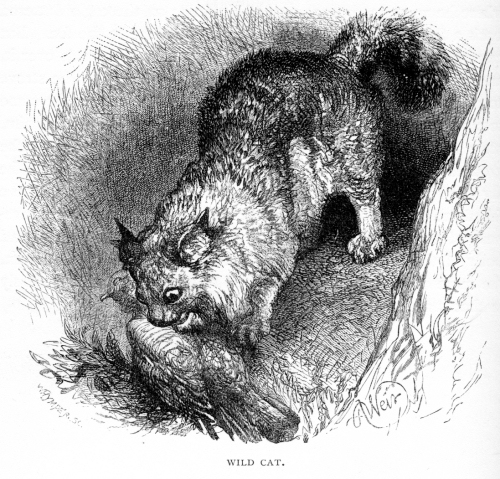 THE true wild cat is gradually becoming extirpated, owing to the increasing preservation of game; and though difficult to hold in a trap, in consequence of its great strength and agility, he is by no means difficult to deceive, taking any bait readily, and not seeming to be as cautious in avoiding danger as many other kinds of vermin. Inhabiting the most lonely and inaccessible ranges of rock and mountain, the wild cat is seldom seen during the day time; at night (like its domestic relative) he prowls far and wide, walking with the same deliberate step, making the same regular and even track, and hunting its game in the same tiger-like manner; and yet the difference between the two animals is perfectly clear, and visible to the commonest observer. The wild cat has a shorter and more bushy tail, stands higher on her legs in proportion. to her size, and has a rounder and coarser look about the head. The strength and ferocity of the wild cat when hemmed in or hard pressed are perfectly astonishing. The body when skinned presents quite a mass of sinew and cartilage. I have occasionally, though rarely, fallen in with these animals in the forests and mountains of this country; once, when grouse-shooting, I came suddenly, in a rough and rocky part of the ground, upon a family of two old ones and three half-grown young ones. In the hanging birch-woods that border some of the Highland streams and lochs, the wild cat is still not uncommon, and I have heard their wild and unearthly cry echo far in the quiet night as they answer and call to each other. I do not know a more harsh and unpleasant cry than that of the wild cat, or one more likely to be the origin of superstitious fears in the mind of an ignorant Highlander. These animals have great skill in finding their prey, and the damage they do to the game must be very great, owing to the quantity of food which they require. When caught in a trap, they fly without hesitation at any person who approaches them, not waiting to be assailed. I have heard many stories of their attacking and severely wounding a man, when their escape has been cut off. Indeed, a wild cat once flew at me, in the most determined manner. I was fishing at a river in Sutherlandshire, and in passing from one pool to another had to climb over some rock and broken kind of ground. In doing so, I sank through some rotten heather and moss up to my knees, almost upon a wild cat, who was concealed under it. I was quite as much startled as the animal herself could be, when I saw the wild-looking beast so unexpectedly rush out from between my feet, with every hair on her body standing on end, making her look twice as large as she really was. I had three small Skye terriers with me, who immediately gave chase, and pursued her till she took refuge in a corner of the rocks, where, perched in a kind of recess out of reach of her enemies, she stood with her hair bristled out, and spitting and growling like a common cat. Having no weapon with me, I laid down my rod, cut a good-sized stick, and proceeded to dislodge her. As soon as I was within six or seven feet of the place, she sprang straight at my face over the dogs' heads. Had I not struck her in mid air as she leaped at me, I should probably have got some severe wound. As it was, she fell with her back half-broken amongst the dogs, who, with my assistance, despatched her. I never saw an animal fight so desperately, or one which was so difficult to kill. If a tame cat has nine lives, a wild cat must have a dozen. Sometimes one of these animals takes up its residence at no great distance from a house, and entering the hen-houses and outbuildings, carries off fowls or even lambs in the most audacious manner. Like other vermin, the wild cat haunts the shores of the lakes and rivers, and it is therefore easy to know where to lay a trap for them. 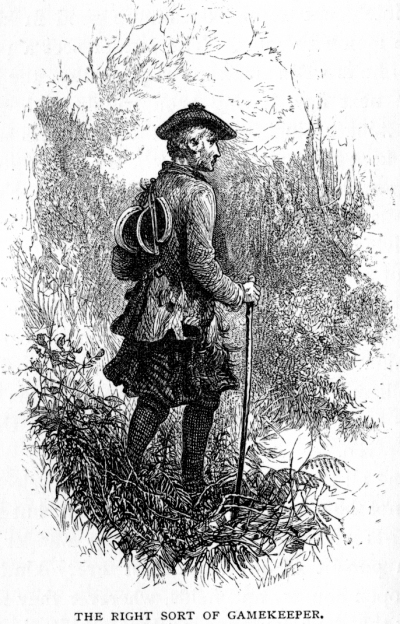 Having caught and killed one of the colony, the rest of them are sure to be taken if the body of their slain relative is left in some place not far from their usual hunting-ground, and surrounded with traps, as every wild cat who passes within a considerable distance of the place will to a certainty come to it. The same plan may be adopted successfully in trapping foxes, who also are sure to visit the dead body of any other fox which they scent during their nightly walk. There is no animal more destructive than a common house-cat, when she takes to hunting in the woods. In this case they should always be destroyed, as when once they have learned to prefer hares and rabbits to rats and mice, they are sure to hunt the larger animals only. I believe, however, that by cropping their ears close to the head, cats may be kept from hunting, as they cannot bear the dew or rain to enter these sensitive organs. Tame cats who have once taken to the woods soon get shy and wild, and then produce their young in rabbit-holes, decayed trees, and other quiet places; thus laying the foundation of a half-wild race. It is worthy of notice, that whatever colour the parents of these semi-wild cats may have been, those bred out of them are almost invariably of the beautiful brindled grey colour, as the wild cats. A shepherd, whose cat had come to an untimely end — by trap or gun, I forget which—in lamenting her death to me, said it was a great pity so valuable an animal should be killed, as she brought him every day in the year either a grouse, a young hare, or some other head of game. Another man told me that his cat brought to the house during the whole winter a woodcock or a snipe almost every night, showing a propensity for hunting in the swamps and wet places near which the cottage was situated, and where these birds were in the habit of feeding during the night. A favourite cat of my own once took to bringing home rabbits and hares, but never winged game. Though constantly caught in traps, she could never be cured of her hunting propensities. When caught in an iron trap, instead of springing about and struggling, and by this means breaking or injuring her legs, she used to sit quietly down and wait to be let out. There is a cat at the farm now, who is caught at least twice a week, but from adopting the same plan of waiting quietly and patiently to be liberated, she seldom gets her foot much hurt. The animal that requires the greatest care in trapping is the fox. If the trap is too smooth, he slips his foot out; if too sharp, he cuts off his foot, and escapes, leaving it behind him. I consider the best manner of having fox-traps made is to get them without teeth, but with about three spikes of an inch in length on each side of the trap; these entering the animal's leg without cutting it, hold him firmly and securely. The surest way, however, of destroying foxes (I am speaking of course of foxes of the Highlands, where no hounds are kept) is by poison. But then the rabbit or bait in which the poison is laid should not be touched by the hand, so suspicious is this animal of the slightest taint of man. The most artistic way is to catch a rabbit or crow in a trap, and having killed it with a stick, a small slit should be cut in the head, without, however, touching the animal with the hand; into this hole three or four grains of the poison called Strychnia should be dropped. So powerful is this poison, that a fox having eaten the above quantity seldom goes thirty yards before he dies. Strychnia is the concentrated part of Nux vomica. Though frequently much adulterated, it can generally be obtained of sufficient strength from any respectable druggist. The Strychnia is, I believe, mixed with a little alkali, to prevent its power being destroyed by exposure to the air. In poisoning crows with it, a very small quantity is sufficient, and it should be put into a slit in the skin or the eye of a dead animal. Before a carrion crow has taken three or four pecks at the poisoned carrion he falls backwards perfectly dead. Weazels, stoats, and all vermin are destroyed by it with equal ease. The drug having no smell, these animals are not shy of eating a dead rabbit or bird on which it has been placed. Foxes and large vermin always commence at the head of their prey, while for smaller vermin and birds a hole should be cut in the skin to receive the poison, as they generally begin their operations whenever they see an opening, where the flesh is exposed to view. It is needless to give a warning against using this powerful drug rashly, as no man in his senses would place it anywhere but in the most secure situations. It is worth remembering, that foxes, carrion crows, and many other destructive animals, will eat a dead rat, whereas no dog will do so. By poisoning the dead bodies of this animal, therefore, no risk is run of destroying your dogs. An equally good way of applying Strychnia is in the body of a wild duck or a wood-pigeon. Many a fox, whose worldly experience nearly ensures him safety from trap or gin, will fall a victim to this poison; for so small a quantity' is necessary, and so scentless is it, that a sufficient dose is swallowed before the animal discovers its presence in anything which he is eating. From the extreme rapidity with which it acts, destroying life almost instantaneously, it is perhaps as merciful a way of putting an end to noxious and troublesome animals as can be devised, and no method can be more certain. I have always been of opinion that nine keepers out of ten who carry guns are but of little use in destroying vermin. The grand desideratum in preserving game is, that the animals should be left in perfect quiet. A man walking about with a gun in his hand, shooting at magpies and crows, does nearly as much mischief to the preserves as if he shot at the game itself. A quiet intelligent trapper does more good in killing vermin than a dozen men with guns. The former sees a pair of crows, or a stoat; if he is well skilled in his profession, the creatures are dead by the next day, having been caught without noise and without disturbing a single head of those animals which are required to be kept in peace and quiet. The shooting keeper, in making his way through woods and coverts to get shots at vermin, often fails in killing it, but is sure to disturb and molest the game, driving it here and there, and exposing it to the view and attacks of hawks and poachers. I have always a far better opinion of the usefulness of a keeper when I see him with a number of traps on his shoulder, than when he carries his gun always with him. It is no bad amusement occasionally to accompany an intelligent and experienced trapper on his rounds, and see his plans to deceive and entice the fox and the otter, the hawk, or the raven. In catching all these animals, the spot to be selected for trapping should not be near their abodes or nests, but in that part of the outskirts of the covers where they wander during the night-time in pursuit of prey. Almost every kind of vermin hunts in the open country and fields, wherever they may lie concealed during the day : for knowing that rabbits, hares, and the other animals which form their principal food, resort to the pastures, the corn-fields, or the waterside to feed during the night, to these same places do their hungry enemies follow them. Hawks and crows too, who feed in the day-time, are perfectly aware that they have a better chance of seeing and catching their prey in the open country than in the woods and covers. Besides which, a hungry fox or hawk, hunting for game, is less on his guard than when prowling quietly and cautiously through the woods.